Air pollution means the presence of toxic chemicals in the air, which is probably the most serious environmental problem that is challenging the civilization today. It is mainly caused by human activities that include construction, transportation, mining, industrial work and many others. However, there are many other causes of air pollution too and that includes volcanic eruptions, wildfires and etc. 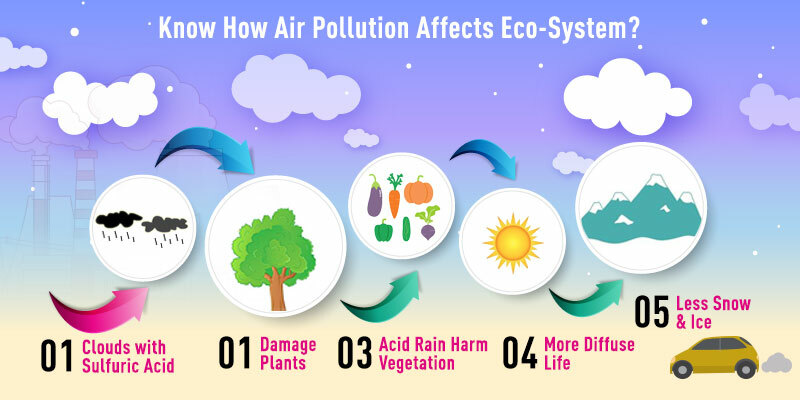 There are different causes and effects of air pollution and in this blog, we will focus on environmental impacts of air pollution. What is there in Pollute Air? Air pollution consists of gaseous, liquid, or solid substances that tend to interfere with human health and even causes environmental damage. The presence of sulfur oxides, nitrogen oxides, carbon monoxides, VOCs, Particulate Matter, and other chemical compounds dangerously affects the ecosystem. 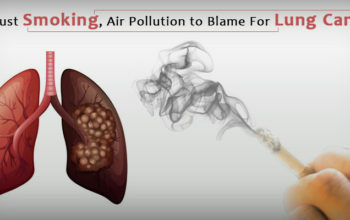 It is the dangerous pollute air that causes acid rain, ozone depletion, smog, and causes many other ecological effects. 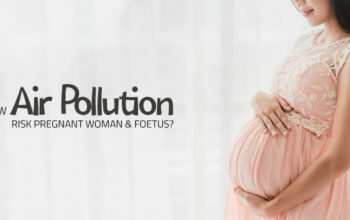 But, by understanding the connections between the causes of pollution and its solution we can together make the changes. This will help in passing a more maintainable world for the future generations to live in. Acid Rain: Acid rain falls in the form of rain, snow, particulates and even fog that damages trees and acidifies soils. This creates ecological imbalance thereby making the environment inhospitable for fish and wildlife. Haze: When sunlight hits the chemical particles like sulfur dioxide and nitrogen oxide it causes haze. This air pollutant gets carried by the wind and form particles in the air thereby making it difficult for the people and even the wildlife to see objects clearly. Ozone Depletion: Ozone is present in the atmosphere, which protects the Earth from the harmful sun’s UV rays. Unfortunately, due to the ozone-depleting chemicals, the ozone in the atmosphere is getting damaged. The harmful effects of ozone depletion can be very risky as exposure to this can increase the incidence of skin cancer, cataracts, and even impaired immune systems. Besides this, the increased UV radiation can also harm the plant life thereby affecting the ecosystem. More important thing is that people those who get exposed to high levels of air pollutants may experience different health effects and these include irritation of the eyes, nose, and throat, wheezing, coughing and etc. You can also experience chest tightness and even difficulties in breathing. Exposing to air pollution can cause lung and heart problem to older people and this can be increased the risk of heart attack. In addition to this, long-term exposure to air pollution can even cause many problems like cancer, damage to the immune, neurological problems and many others. In extreme cases, it can even cause death. Do you know the air that we breathe is full of toxic and hazardous pollutants? It is due to the dangerous air pollution that each year millions of people die throughout the world. Since we are the main cause of air pollution, it is we who should find the solution to it. We need to identify the sources of air pollution and even try to implement the practical ways that can help in stopping air pollution. Some of the solutions are like planting trees, using low VOC products, and making use of solar energies, using natural gas instead of charcoal and many others. Beside this, quit smoking, stop using hazardous chemicals, avoid using plastic bags, buy items that are made using recycled materials. Gases, particulates, and biological molecules combined together to make air pollution. This can cause diseases, allergies and even death of humans in severe condition. It may not only harm the living organisms but can even damage the natural or built environment. 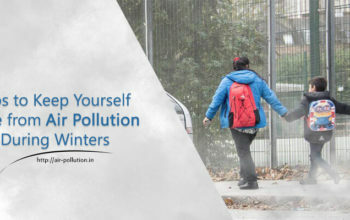 If you want to stay in a healthy atmosphere and create a better tomorrow for your children, it is high time to stand unite and stop air pollution. Work together to find a solution to air pollution and save the ecosystem.